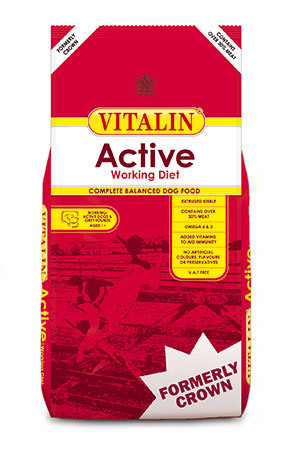 Vitalin ACITVE is a nutritionally complete balanced working dog food in an extruded kibble and does not require any additional meat or supplements. 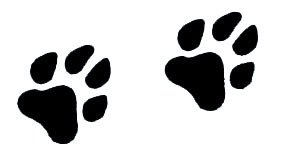 Vitalin ACTIVE is made with tasty chicken, meat & marrowbone, wholesome cereals and vegetables to provide the correct balance of proteins and carbohydrates necessary for an active dog. Vitalin ACTIVE has the correct balance of Omega 6 & 3 fatty acids to promote healthy skin and coat condition and is fortified with antioxidant vitamins A and E to help boost the immune system. 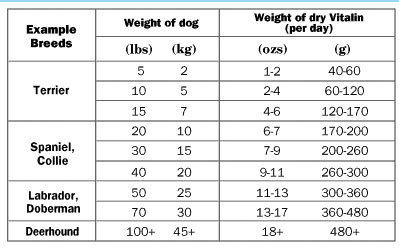 Vitalin ACTIVE has a carefully balanced formulation of all the essential vitamins and minerals your dog needs for a happy, healthy, active life. Prices include free delivery in Malta. International customers please contact for shipping costs. 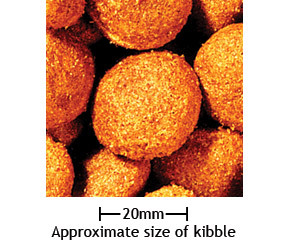 Protein 24%, Oil 10%, Fibre 3%, Ash 7%, Moisture 10.5%, Copper (Cupric Sulphate) 19 mg/kg.